Hawkeye is in New Mexico to investigate a small community’s contaminated water supply. He’s lauded by everyone he meets, relieved that he killed the Hulk. They’re treating him as a hero, but Clint Barton doesn’t feel good – Bruce Banner put him in an awful position by asking him to kill his brutish alter ego. Having been exonerated by the authorities, he’s living with what he’s done, away from the superheroes among whom he once felt so comfortable. 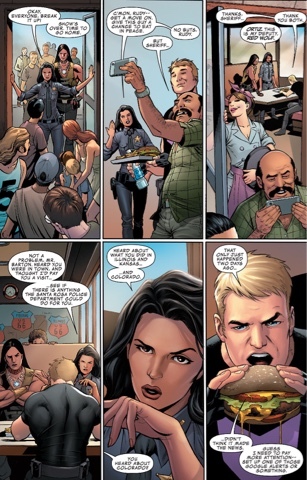 As he finally gets to pick up his burger – if not actually bite into it – Clint gets a courtesy visit from the local law enforcement. Presumably this Red Wolf isn’t the same superhero who ran into the Avengers when Clint was acting as Goliath, as they don’t seem to know one another. They do team up, sort of, when Clint is attacked by machine gun-toting bad guys who don’t like strangers. I didn’t know anything about this going in. 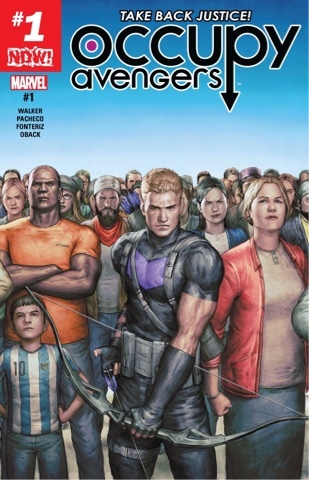 The title is awful, Agustin Alessio’s cover almost a parody in its earnestness, but I’ll try any book starring Hawkeye. And now I’ve tried it, I’ll bow out… this comic lacks the colour and verve I want from an Avengers book, and there’s nothing in here to convince me it’s coming. Hawkeye is super-low key in his arrow-based heroics, Red Wolf lacks the character’s goofily joyful classic look and the idea of an Avenger investigating dodgy water is very dull. Clint is no chemist, he’s not equipped for such a specific mission – he should be shooting trick arrows at lunatic villains among New York’s concrete canyons, not moping around in the dusty south west. As for Red Wolf, presumably a future member of whatever team Clint puts together, he’s too much the strong, silent type to spark any interest. And it’s not like Occupy Avengers has mediocre creators – David F Walker produces some great dialogue (though he apparently can’t spell ‘Cholmondely’) while the pencils of Carlos Pacheco, as ever, are sharper than an arrowhead. Inker Rafael Fonteriz and colourist Sonia Oback enrich Pacheco’s work. The New Mexico setting is clever, the Hulk having been ‘born’ there and regularly rampaged in the region. But I’m simply not engaged, this is all too mundane for the Marvel Universe and it feels so, so dated. 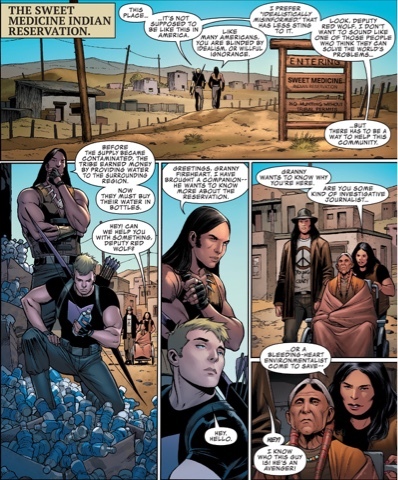 Never mind that Occupy hasn’t been a zeitgeist term for a couple of years, this feels like an early Seventies Relevance comic, with Clint hanging around a Native American reservation, acting as naively as Hal Jordan in Seventies Green Lantern/Green Arrow. DC Comics charges $2.99 for 20 pages of story and art. This comic book gives you 20 pages for $4.99. If Clint Barton really cares about justice for the little guy, he might want to call on Marvel Comics. I think this is less influenced by Occupy as a concept – Gail Simone did a much more timely job of jumping that relevance bandwagon with the underrated The Movement – and more by the current success of TV's Mr Robot. The depiction of a Native American reservation had me biting my knuckles. The 'Indian' reservation did seem rather Olde World Cliche, but I assumed an American writer would have tried really hard for a truthful presentation. Seems not! That title really isn't going to help the series, is it? Why not South-West Not Coast Avengers? I really don't see how Marvel is getting with this. Good review. 70s throwback indeed. Why is it that this sort of comic always happens to bow-slinging vigilantes? Must be a Robin Hood thing. It's a good thing that superheroes run into masked machine gun toting thugs who are working for those contaminating the water supply, instead of neglect by government officials, institutionalized poverty, and engineering measures used to cut costs at the expense of safety. But then, we wouldn't need superheroes. I reckon I'd enjoy any of your scenarios more than this comic. There's no excuse for a book to be this dull.